I had never seen anyone so excited about receiving a Bible. But I understood why. “I have a surprise for you,” I announced to my midwife students at Gimbie Adventist College of Health, where I volunteered as a nurse-midwife instructor in Ethiopia. “The chaplain just called to tell me that the hospital has Bibles for you—.” That was as far as I got before a joyful roar drowned out my voice. My students were clapping their hands, stomping their feet, and gleefully pounding each other on the back. I had never seen anyone so excited about receiving a Bible. But I understood why. Literacy in any language is often elusive in rural Ethiopia, and my students considered their ability to read a blessing. Finally, they would be able to read God’s Word for themselves. Furthermore, all of my students were struggling financially. Tolessa, for example, did not have money for supper if he did not give a couple haircuts at his “barbershop” after school. It would have been difficult for any of them to buy a Bible on their own. Bibles in the language of the Oromo people are particularly difficult to find because their language became a written one only recently. Thankfully, generous donors helped the hospital buy every copy that could be located. Then the hospital resold them at cost. I know that it may sound terrible to sell Bibles, but this was done for a reason. Studies have shown that people are more likely to value and use something if they have had to sacrifice a bit to get it. And, if we gave the Bibles away, some people would sell them on the black market. We subsidized the cost for those who needed it, and the income from the sales helped us buy more Bibles. They sold like hotcakes! 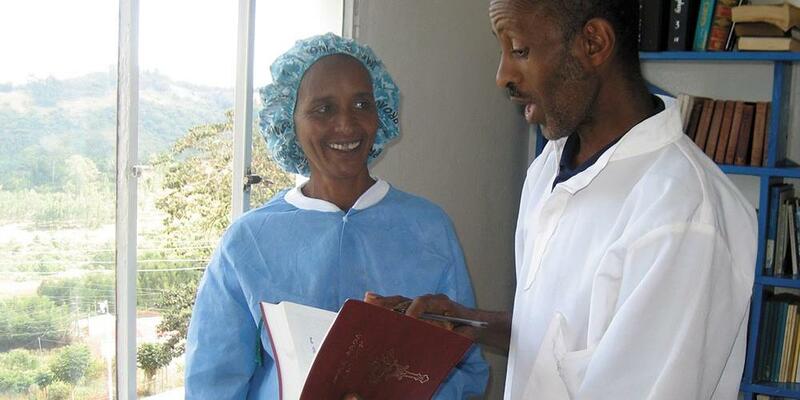 All that being said, Gimbie Adventist Hospital wanted to provide each of its employees and students with a Bible of their own. With our donors’ help, the chaplain’s office distributed Bibles to all the departments as supplies became available. Finally, it was my midwife students’ turn to receive their Bibles. I wish you could have seen them! They were practically dancing. I felt a little overwhelmed by their emotion. I have nine different Bibles, and there are days that I don’t read from even one of them. Becky Dice is a certified nurse-midwife who volunteered four years in Ethiopia working as a nurse, midwife, and teacher at the Adventist Health Science College in Gimbie, Ethiopia. Most recently, she and her husband, Austin, volunteered as consultants in Liberia. They are now in the United States, raising their son, Cyrus.